When you mention retire to Colombia...most think of Pablo Escobar, cocaine, kidnapping, los Pepes, and guerillas. For some that will be reality for several years to come. For the few that see an opportunity it is a bargain hunters paradise. For those wise enough to consider overseas retirement, they thank the media for perpetuating the idea that these countries are in a war zone. You have to love the media...when the President of Uruguay recently met with Hugo Chavez of Venezuela...terms like "left wing tyranny" were used to describe the Uruguayans...it was meeting on an oil deal that has been in place for 6 years. Last time I heard Pablo Escobar was still dead...drug violence is way down and opportunities abound for the smart investor in Colombia...come on down, Juan Valdez has a great cup of coffee waiting just for you. Because of the misconceptions the media harps on...you can pick up some real bargains in Colombia...well located homes, for less than $100,000. 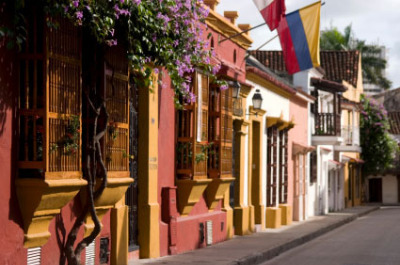 Read about one couple's plan to retire to Colombia. 15 years ago you could buy homes in Costa Rica and Mexico for a song...Colombia has every potential to appreciate like them today. If you would like more specifics on buying Colombian real estate. Cartegena, picture above, is one of the finest colonial cities in South America...the walled city was a major port for transporting the wealth of the Incas back to Spain. Bogota, if you like spring time, 70 degrees F, 12 months a year, is worth a look for the big city lovers. At 8500 feet it is very pleasant urban living. If the beach is your thing head for Santa Marta, 80s and 90s but without much humidity, rare so close to the Equator. The laser surgery technique which has freed millions from wearing glasses, including me, was developed first in Colombia. Folks from all over the world come to have surgery done in Colombia...including Diego Maradona from Argentina...he chose Colombia for gastric bypass surgery. Colombia is also one of the leading growers of flowers in the world.